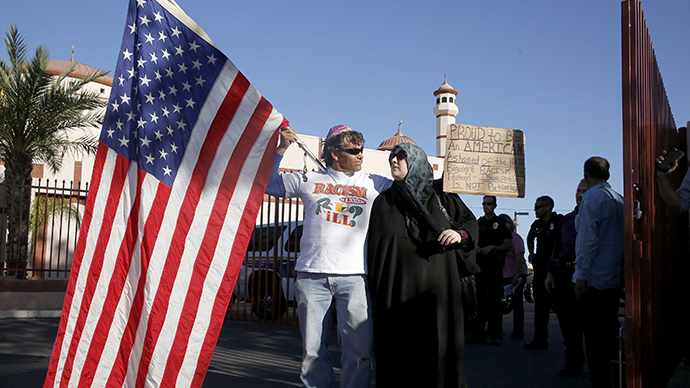 The gathering outside the Phoenix mosque became a convergence of two rival protests with a phalanx of police officers separating the two. Despite anti-Islam event organizers calls on participants to bring guns and Mohammed cartoons and feel free to exercise their“constitutional right,”the event remained peaceful. A large group of people with signs reading “Love not Hate,” and “Provoke Peace,” came ahead of the provocative event planned to coincide with Friday prayers, and lined up near the mosque. In anticipation of trouble, Arizona police also stepped up security in the area to prevent provocations and defuse tensions should the events turn ugly. Only a few people showed up for the mosque’s scheduled prayer service, as “pro-free speech” protesters began arriving, , some carried guns, wearing offensive t-shirts and placards, and waving American flags. Only a handful of some 7,000 people who had been invited to attend the event via Facebook, have shown up. Jon Ritzheimer, a former marine, and self-proclaimed “anti-Islam activist” organized the event on Facebook, and called for people to join him for a protest outside the mosque as part of a peaceful rally, but instructed that guns be brought as a precaution in the event that they came under attack.